The Ignition OEE Downtime Module has received much praise since its release in 2011. During the past year, users from a broad range of industries have provided feedback on things they’d like to see added to the module — and many of those ideas we’ve taken and implemented into the software. To make sure you’re aware of the key enhancements, we’ve included a brief summary below of the key new features that are available in the OEE Downtime Module. We are committed to the constant improvement of our MES modules, and encourage your continued feedback to shape Ignition around your needs. Now you can group cells. If a process stream splits into parallel paths or if you just want to track a group of cells separately, the OEE Downtime Module can determine the downtime reason and track OEE for the cell group. Grouping of downtime reasons into various sub groups is now supported. In addition, you now have complete control of when the operator or supervisor can select each downtime reason. There is also support for selecting a different machine as the cause of the downtime other than what was automatically detected. You can now organize your downtime reasons into sub groups, and override automatically-detected reasons by manually selecting a different reason. An example of this would be a conveyor belt coming apart and jamming the downstream machine, but the downstream machine faults and is automatically detected rather than the true reason. You can now override the automatically-detected reason. Both the original machine and reason – along with the operator machine and reason – are tracked and can be included in reports. Downtime reasons can be changed after a production run is complete. This allows operators or supervisors to provide more detail for downtime events. Even the OEE Availability will update when changing an unplanned downtime reason to a planned downtime reason, and vice versa. Production counts can be entered or updated after a production run is complete. This supports implementations where production counts are not as straightforward as containers. It also supports updating production and waste counts based on warehouse or lab data that trickles in hours or days later. Results in the OEE Downtime analysis screens, including charts and tabular data, are updated with live, to-the-minute production data. No longer do you have to wait for the next hour or the production run to complete. Of course, if you do not want the live data to appear in the analysis, you can also do that. Using redundant Ignition servers, the OEE Downtime systems will not miss a beat if the primary Ignition server is taken offline in the middle of production runs. This ensures that a production’s run data integrity is not damaged from server issues. The OEE Downtime Module now supports downtime reasons to be remotely selected on OITs (operator interface terminals). This allows the OEE Downtime module to be used without replacing existing hardware on the plant floor. See detailed scheduled versus actual information of production runs in real time, including changeover, planned, unplanned and other types of downtime. 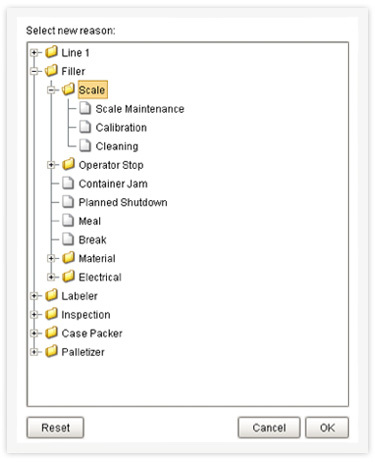 By including machine downtime details, you can see the effects that one machine’s downtime has on the other machines and the production line. You can see all information for a downtime event including type, duration, machine, automatic-detected reason, operator-selected reason and notes by simply clicking on the event in the chart. You can now easily click on any downtime event by simply clicking on the event to display the downtime reason. Because not all OEE Downtime implementations are alike, several scripting functions have been added to allow starting, stopping and scheduling of productions runs and much more. Instead of modifying your production procedures to accommodate the OEE Downtime tracking software, the OEE Downtime Module can accommodate your production procedures. Even the OEE formulas can be changed at a system level that will be reflected in all historical and real-time OEE values. In addition to the new features listed above, we have added many other smaller features and improvements including more analysis options, current downtime information tags, hide and filter production codes, speed improvements, cell bypass, downtime table client time zone, workday routine reason code, touchscreen support and more. If you have a requirement that is not currently supported by the OEE Downtime Module, please let us know what it is as we are committed to making our product adaptable to various industries and production environments. Just give us a call at (800) 266-7798 or email us at info@inductiveautomation.com.